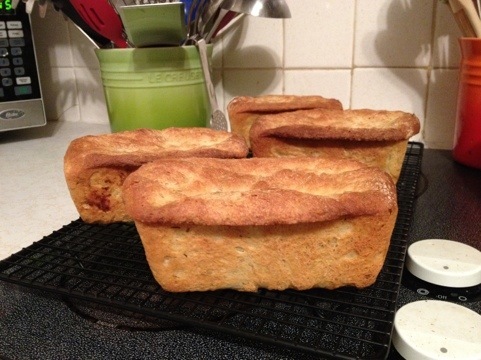 Yup, those are four fallen loaves of herbs de Provence bread. Few things put me in a more sour mood than fallen bread. There is just something so deflating about putting all that hard work into something, only to have it turn out poorly. So, that, coupled with my rushed-through and barely understood chemistry homework and forgotten phone call (sorry Emily! ), put me in quite the mood last night before bed. Back to the bread… I think what happened (which must happen often since almost ALL my breads fall) is that I allowed my bread to overproof, or over rise. While I don’t normally lose track of time, I did last night (ahem, can we say chemistry homework) and didn’t check on it until the very end of the recommended rise time. The loaves looked great, until I pulled the cover off and they proceeded to deflate. Heartbreaking. Posted on February 1, 2012 February 27, 2016 by thehealthypineapplePosted in Breakfast & BreadsTagged bread. Oh, they do taste good! I’ll definitely be keeping this recipe, and can’t wait to give it another go, especially after talking to a baking rep at King Arthur Flour yesterday and getting some good advice and encouragement!